On Remembrance Sunday 2010 the village War Memorial at Thurgarton was rededicated following restoration work. It was erected in 1919 in the old village pound next to the blacksmith’s forge at the central crossroads of the village. It is an impressive cross of white Portland Stone set on a stepped octagonal base on which are carved the names of ten village men who died in the 1914-8 War and two from the 1939-45 War. An additional victim of the first war has been added to the restored memorial – that of Thomas Paling who died from war wounds in 1920. The census of 1911 shows a parish population of 285 of which roughly 60 young men would have been eligible for active service in the 1914-8 war. 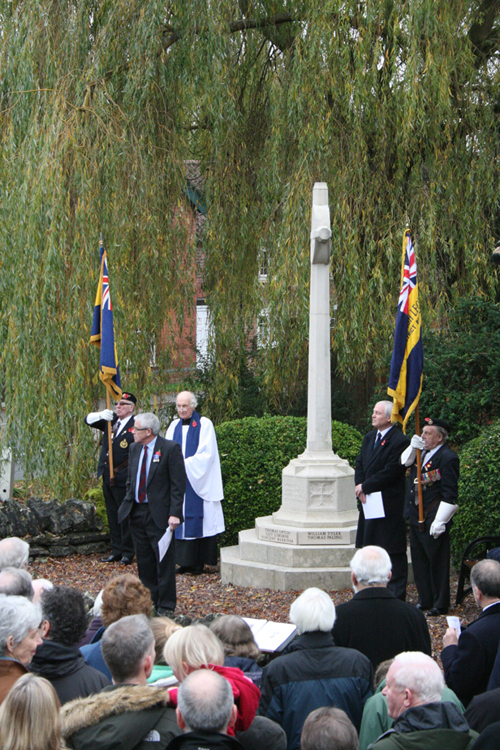 The Parish Roll of Honour numbers over 40 names who served, about two in three of the village’s young men. Charles Baylay Born in 1876 he was the oldest child of Alice and the Rev.Atwell Baylay, vicar of Thurgarton and grew up in the Old Rectory. 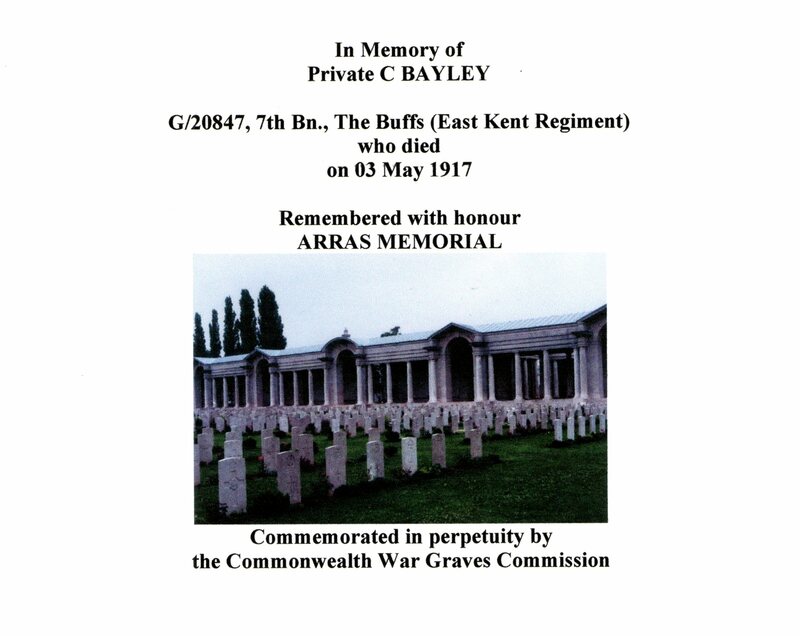 He moved to Bromley Kent and joined the East Kent Regiment (The Buffs). 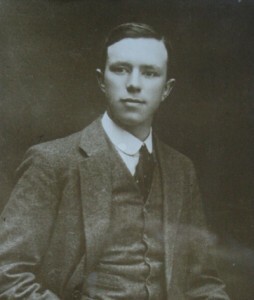 He was killed in action during the Battle of Arras ( 9 April –16 May 1917) when British and Allied troops attacked the German trenches around the city of Arras and although succeeding in capturing strategically important gains, especially the Canadians at Vimy Ridge, did so at the cost of over 120,000 British casualties. 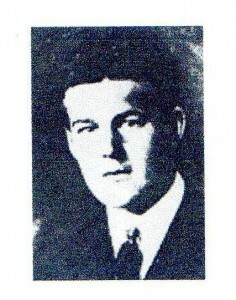 John William Bentley was born in 1896, the fourth child of Robert and Alice Bentley of Manor Farm. 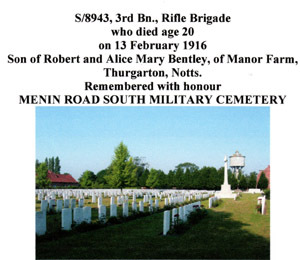 He worked on the family farm until joining the army on 13th March 1915 aged 19 years; after basic training he was posted to the 3rd battalion Rifle Brigade. He was killed in action in the trenches at Hooge during the bitter battle for the Ypres salient on 13th February 1916. Harry Fisher was the third child of Rose and Job Fisher, Railway Station Master at Thurgarton for over 20 years. 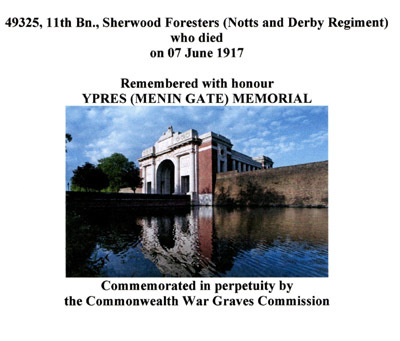 He joined the 12th Battalion of the Sherwood Foresters which moved to France in August 1915 and was killed in action in the lines at Ypres on the 15th February 1916. Arthur was born in 1889 the second of three sons to Mary and Charles Marson of Hill Farm cottages. 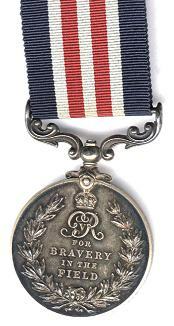 He joined early and was posted to the 6th Battalion of the King’s Own Yorkshire Light Infantry. 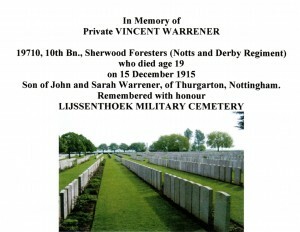 He was promoted to Corporal but was killed in action near Ypres on 15th August 1915. Thomas was born on 19/3/1887 the fourth child of Elizabeth and Henry Paling, joiner who lived on Bleasby Rd. 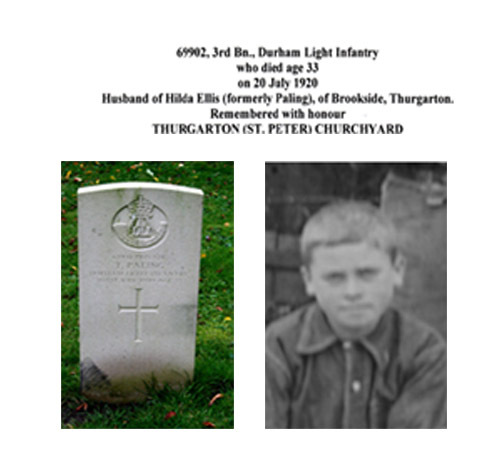 We have little detail of his war service but we know that he joined the Durham Light Infantry and was severely wounded in France. He died on 20 July 1920. 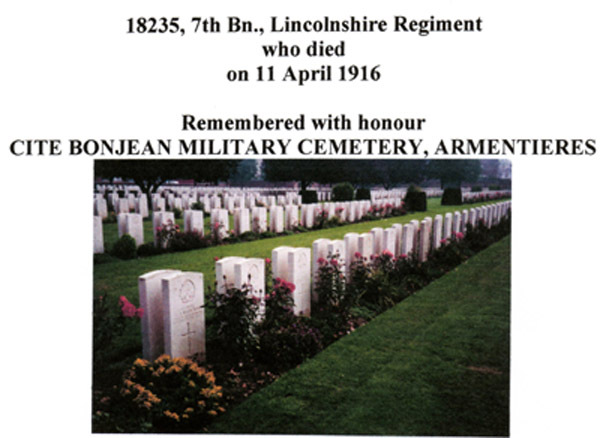 We have no further details on Private G H Smith. 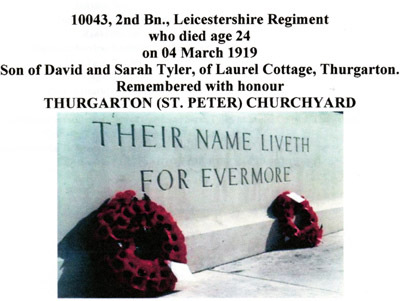 William Tyler born on 22/4/1896 was the second child of Sarah and David Tyler, farm worker who lived at Laurel Cottage, Thurgarton (demolished for Corner Croft bungalows). He joined the 2nd Battalion Leicestershire Regiment at the outbreak of war. In August 1915 he was severely wounded (a gun shot to the abdomen) and was shipped home for convalescence. In 1916 he embarked for Basra as part of the ill-fated Kut campaign but came down with malaria. Having survived all this he sadly fell victim to the Spanish flu epidemic and died at home on 4th March 1919. Mrs Upton of Thurgarton Priory lost two grandsons in the war, both are commemorated on the village war memorial. Captain Thomas Upton and his parents would have been houseguests at The Priory. 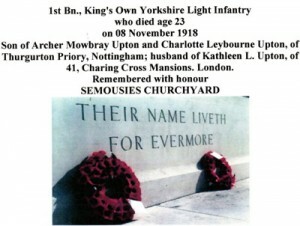 He joined the 1st Battalion King’s Own Yorkshire Light Infantry and was killed in action a mere 3 days before the armistice. The regimental diary states that he was killed in fierce fighting as the battalion attacked Douriers and the Avesnes Road. His grave is one of three war graves in the small churchyard at Semiouses. Sub-lieutenant Royal Navy Born on 9/10/1900, Guy Usborne would have lived at Thurgarton Priory for some of his youth – his parents and grandmother (Mrs Upton) lived there before and during the war. The Usborne family had a strong naval tradition and Guy served as a junior officer in the British Baltic Fleet fighting in 1919 alongside the Finns, Estonians and White Russians against the Bolsheviks. On 18/8/1919 he joined a small squadron of fast Coastal Motor Boats which attacked the naval fortress at Kronstadt – two battleships and a submarine were sunk but he was one of several casualties and was mentioned in dispatches. 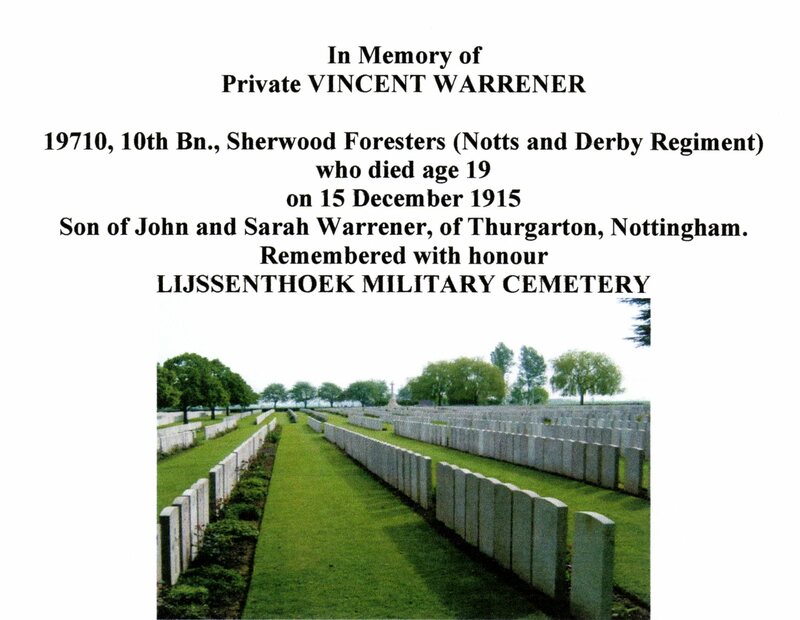 John Vincent Warriner was born in 1897 the first child of Francis and John Warriner, postman who lived on Bleasby Road. On leaving school he became a farm worker and joined up early after the outbreak of war. 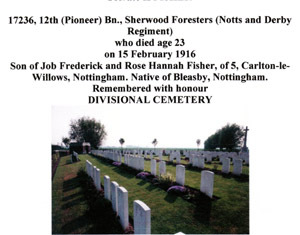 He joined the 10th Battalion Sherwood Foresters which shipped out to France in July 1915. 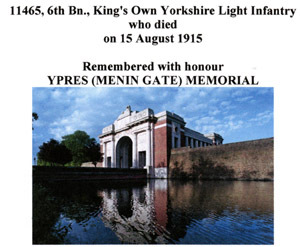 In December 1915 the regiment was in the lines near Ypres on the Menin Road. Both sides suffered heavy bombardment during the first weeks of December with a steady stream of casualties. Vincent was one such casualty and died of his wounds. 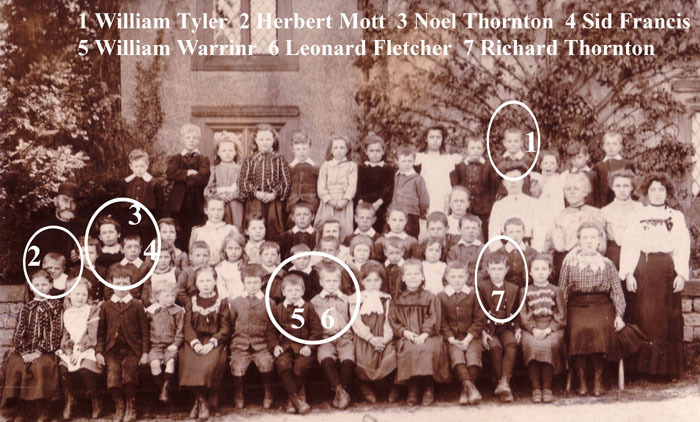 This early school photograph of 1905-6 contains many of that generation of young men destined to fight in the 1914-8 war. Those who can be identified have been highlighted in the photo. Sergeant 633511 160 Squadron RAF Gunner Born in 1920 he lived at Holly Cottage on Priory Road. 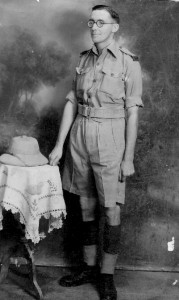 Jack was shot down near Tobruk on 26/9/1942 aged 20 years. A tree now stands in St Peter’s church graveyard in memory of Jack – it was grown from a seed of a pine tree that once stood in Ramleh War Cemetery near Jerusalem where he was buried. Private 5052596 2nd Airborne Division South Staffordshire Regiment. Born in 1917 he lived in Wyer’s Cottage on Beck Street. 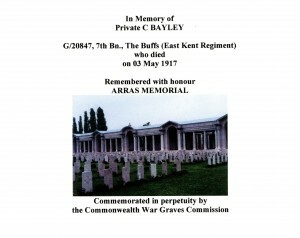 He was killed in action in Sicily on 9th July 1943 aged 26 years and is commemorated on the Cassino memorial, Italy. Grant Burgon son of licensee of Magna Carta Lowdham. 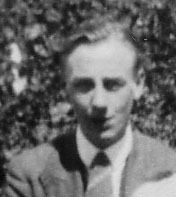 Lived in Appletree Cottage Beck St.
Ernest Crowder joined 1939 A Company Sherwood Foresters but mumps prevented service in Norway. Jack Holmes Territorial Army, oldest of six boys who lived on Beck St.
Wilfred Hornbuckle joined 1939 A Company Sherwood Forresters, served in Norway. Geoff McLean oldest of 6 children in Gate Lodge became Lieutenant in Army, served in Palestine. A Morris son of licensee of Coach and Horses pub. Jack Reeve Asthmatic but passed fit for Navy – two years at Portsmouth. Arthur Sharp TAs and then joined Sherwood Forresters at 17 – too young for Norway. Lived in Beck St.
Robert Scrivener RAF served in Iceland. 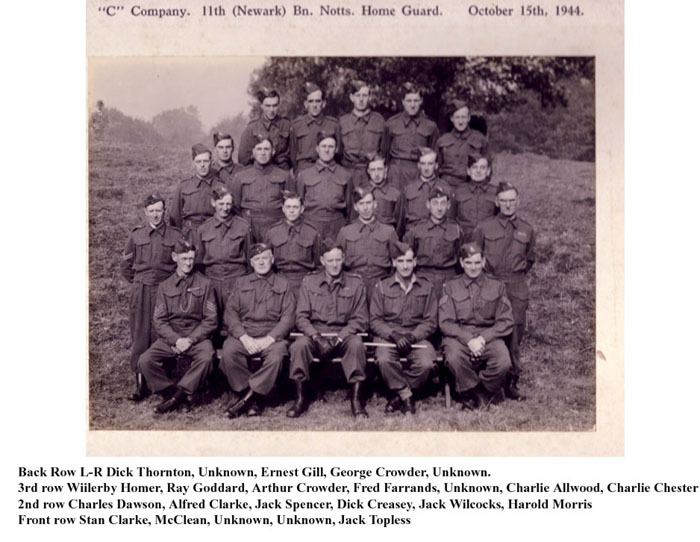 The Home Guard at Thurgarton, about 20 men, drilled at The Hut, an old World War 1 barracks hut which stood on the present village hall site. Amongst many duties they mounted a 24 hours guard at the Railway Station. Thanks for the insight. My family has a long history in Thurgaton. My 7th great Grandfather (Robert) was born there along with subsequent generations.I had the pleasure of a visit a couple of Summers ago and was met by locals as a kind of ‘Prodigal Son’ great to discover and visit Wyer Close. My grandfather Albert Kemp is in the 1905 school photo back row far right. He joined the Seaforth Highlanders in World War One in 1915 and was wounded on the Somme. Does anyone know why he joined a Scottish regiment? As far as I know there is no Scottish connection in the family. He survived the war and moved down to Wiltshire.